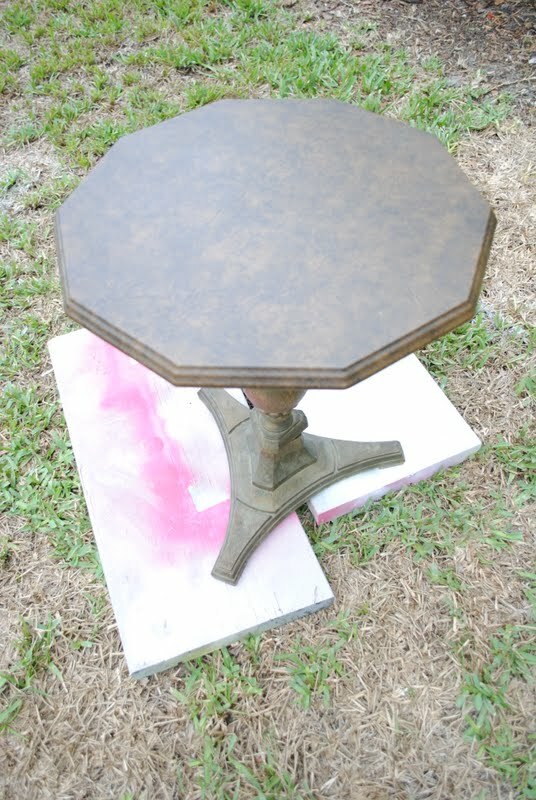 A few weeks ago, I shared this metallic paint with antique glaze finish side table on Craftionary. I found this table at a garage sale for $5.00. It was faux painted in a wood/brown color. I really had no idea what I was going to do with it, but the price was great. 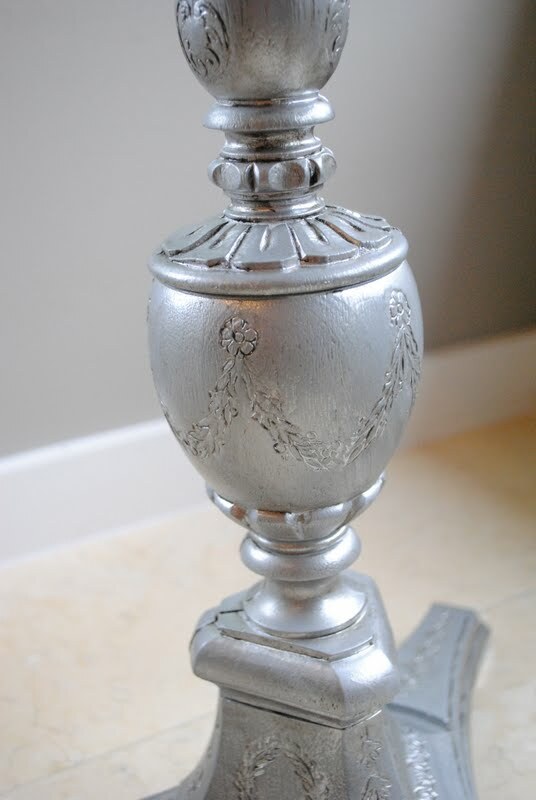 I applied spray paint primer and then I gave it a couple of coats of Rustoleum's Metallic Silver spray paint. ﻿Here it is all nice and shiny. I then used Valspar's antiquing glaze and gave it a light rub down. I'm not a fan of heavy glazing, but I wanted some dimension to the piece. I used a tutorial by Little Miss Penny Wenny (you must see the chair she did) and it worked out great. Here you can see the top. The glazing added some depth to the top. I got so much done at work yesterday and I'm totally inspired to keep going. I'll post pictures of my office as soon as it's all put together. Thanks for all your sweet comments and words of encouragement. I don't think I've glazed but we did re-do a metal bed with the silver metallic paint and I love it. Nice job! This turned out gorgeous! I recendly did this, but I like yours much better!! 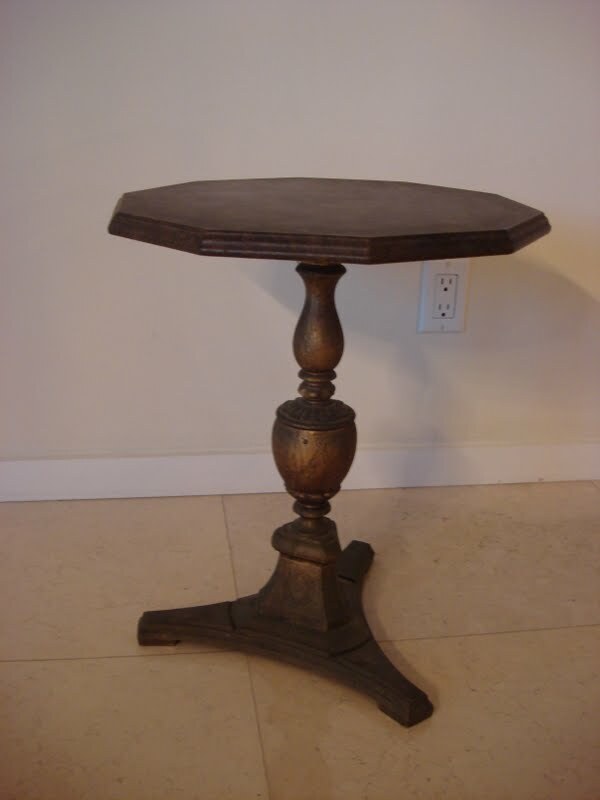 Love what you did to this table....it inspired me to go get one I saw at a thrift store yesterday. It had a veneer top so something like this would be perfect! It looks great! Now I want to try this on a small stool I just got from a garage sale. Adorable!!! I've painted a lot of furniture, but never used a glaze, mostly because I can never find it in the store. I usually take some burnt sienna acrylic paint and use that as a glaze cause it's free. Wow! Gorgeous! This looks super expensive and exclusive now! One of my favorite furniture makeovers ever J*! xox! Oooh! I love the silver! It would make a great addition to a glam retro styled room... Like my office. ;) Great job! It turned out amazing! Great job. I really love it!! i love it! looks so modern and straight out of a catalog! I. Love. It!!! Does the presence of three exclamation points make it clear? love. it. This is easily one of the most colorful and fun projects out there. Tremendous job and thank you so much for using Rust-Oleum! Nice very glam! I just purchased a little round gem yesterday, looking forward to making her shine just like yours. I love this - so pretty! What a great accent piece! I love the depth the glazing gave the whole piece. It's beautiful! Oooh, you're giving me such hope for a gorgeous table I bought at a yard sale last year. I think silver's the way to go! Just found you through Circle of Bliss! This turned out beautifully!!!! I am a working on my desk/table right now and I just can't find the right way to finish the top. I'm thinking this would look really cool. thanks for idea! What a great transformation! I'm a fan of only very light distressing or glazing, if at all. (I prefer clean & classic vs. aged) But the finish you used added a little bit of dimension to the silver. 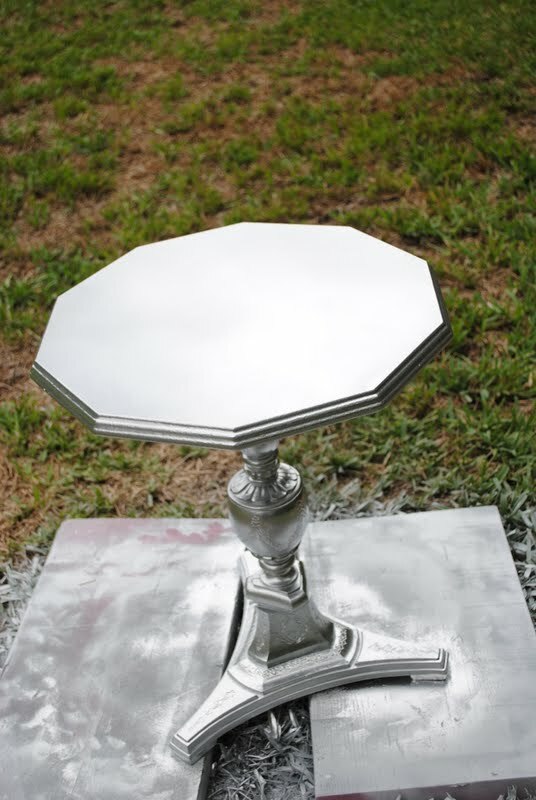 Now that table looks all shiny and new! Beautiful! WOW! What a transformation. Oh you give me hope that I can do this myself one day!!!! Really, WOW. I'm bookmarking so I can remember this!! 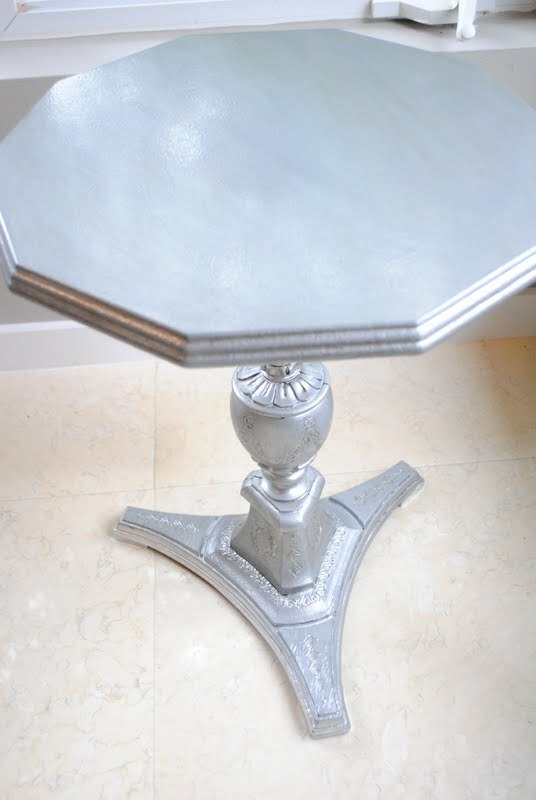 I have a similar table - never thought of painting it silver but it looks great - I had better get busy hey! Embarking on some shabby chic at the moment - hopefully have some photos on my blog on Monday. Love the way this turned out-- the glazing really does make a difference! Just adds that little extra character... Kudos!! This table turned out so darling! It has such great character and charm, awesome find. Thanks so much for the shout out! I appreciate it so much. It is fantastic, I'm having problems getting a smooth spraying effects with spray paints any tips you can share? You gave this table a very nice elegant look. You can really see the little details now. Oooh, tres chic! Yeah, the faux-sponge-brown thing had to go. ;) I would not have thought of metallic, but I love it! Thanks for linking to the Creative Bloggers' Party & Hop! This is beautiful! What a transformation. I'd love it if you stopped by my blog and checked out the giveaway I'm having for a Dremel Trio! oooooh! I love it! Great transformation. Love the table! 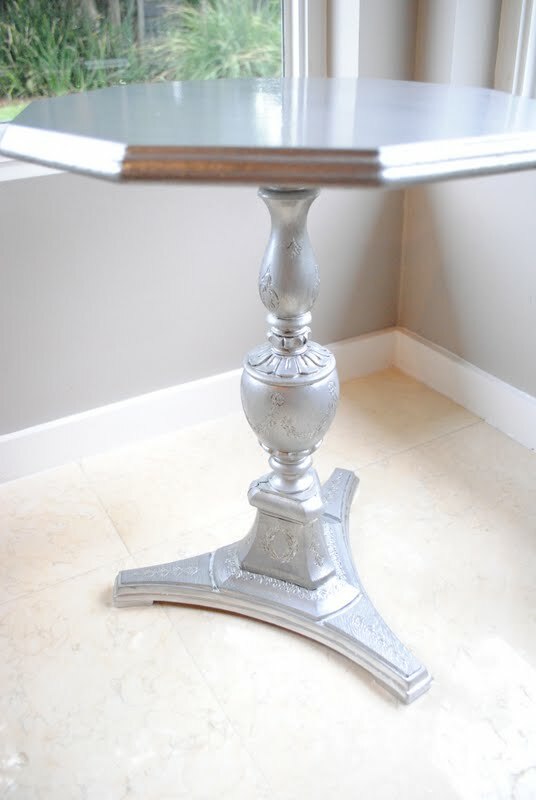 I would have never thought of using a metallic paint, yours turned out amazing! I am featuring you today. I would love for you to feature my projects and pictures, just please link back to me. I always try to do the same. If you see any images here that are not appropriately linked back, please let me know so that I can correct it. Thanks!